Posted on Sunday, June 6th, 2010 at 10:31 am. As we discussed recently in a previous blog about presentation skills, to define your presentation style, you need to know why your audience will be listening to you. To develop important skills in presentation, consider joining Presentation Skills Training Course (Two Day) delivered by pdtraining in Parramatta, Brisbane and other cities in Australia. 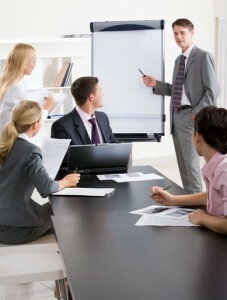 In the business world, there are many different types of presentations. An important element of your presentation skills toolbox is to always imagine how your audience will receive your presentation. If it is a sales presentation, we should build a compelling case for a commercial transaction based on your audience’s needs. If you’re giving a briefing, you need to ensure that the facts are effectively communicated as succinctly as possible so that everyone definitely understands what is being said. In a consultative workshop, the aim is to elicit new ideas and possibly new directions, so the presentation should be structured in such a way as to maximise participation. Even Pro tennis players use coaches! All public Presentation Skills Training courses include am/pm tea, lunch, printed courseware and a certificate of completion. Customised courses are available upon request so please contact pdtraining on 1300 121 400 to learn more.